Dutch Treat is owned by Bas and Kat de Laat. Bas is a verified, natural born "Dutchman" and Kat was raised all over the world as a U.S. "Army Brat." 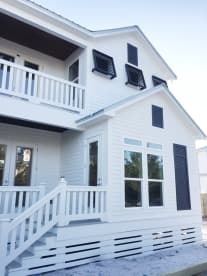 In addition to their love for each other and their beautiful 3 children, they share a passion for life on 30A and relish every moment they get to spend at their home away from home. They love that they are creating special family memories and traditions with each trip to 30A. We hope that your stay with us is a precious part of your own 30A family legacy.